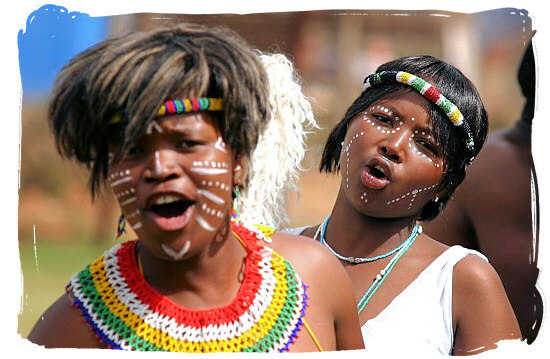 The Xhosa, an ethnic group of SOUTH AFRICA, mostly live in Eastern Cape province in the southeastern part of the country. Although some groups farther north speak Xhosa, they are not considered part of the cluster of Xhosa chiefdoms. The language of the Xhosa reveals clues about their history and their connections with other groups. It is very closely related to the language of the South African ZULU people, but it also shows signs of close contact with KHOISAN groups in precolonial times. Traditionally the Xhosa lived as extended families in scattered homesteads, farming and herding livestock. By the mid-1800s they had lost most of their livestock and land to British colonists. Today many Xhosa live in the major South Africa cities, supported by wages or social services. As in the past, KINSHIP links remain important in daily life. The Xhosa still practice their traditional forms of ancestor worship, with offerings of livestock and beer. Converts to Christianity have blended many old beliefs and practices into the new faith. Many Xhosa still have a strong believe in witchcraft, traditional healing, and other ancient practices. Through the years, they have maintained a rich oral tradition and also developed their own written literature. The Xhosa arts include colorful beadwork and elaborate clothing dyed reddish-brown with ochre, a pigment made from the earth.